This species of Dogwood deserves better recognition in general horticulture. It is a small to medium sized deciduous tree, growing up to 5-7 meters (15-20ft) in height and spread. In late winter delicate clusters of beautifully scented yellow flowers emerge before the leaves. Bloom time can last over a month. 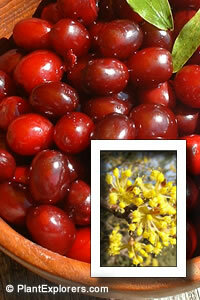 The bright red fruit, known as Cornelian Cherries or Cornels, develop and ripen near the end of summer. The fruit is edible and suitable for a number a dishes, both sweet and savoury. In autumn the leaves turn rich shades of scarlet tinged with purple. For maximum freshness, please keep seed refrigerated in its original packaging until it is time to plant. Sow large seeds in containers in late winter to early spring. Cover with a thin layer of scree (fine pebbles - to prevent rain from splashing out soil). Grow in average to moderately fertile garden soil in full sun to part shade.